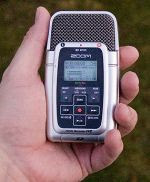 Looking for a comprehensive review of the ZoomH2 flash audio recorder? While many people look to O’Reilly Media for their definitive reviews, from a public radio reporter’s standpoint nobody does it better than Transom. And today they put out their review of the Zoom H2. Overall, I didn’t learn too much new. It’s a tiny recorder that records decent sound from the built-in mics and pretty lousy sound from external microphones. If you’re on a budget and you don’t need broadcast-quality audio, the H2 is pretty attractive. But if you want to use your expensive condenser microphones and get the best possible sound from them you’re going to want to look at a higher end recorder like the Fostex FR2-LE, Marantz PMD670, or Tascam HD-P2. The Transom review does have some interesting tidbits including a bunch of sample recordings.